There are lots of times when it’s hard for our dogs to get outside for some fun time and exercise. It may be too hot, too cold, raining or snowing. If it goes on for more than a day or two, my dogs tend go stir crazy. I’m home most of the day with my dogs Kilo, Buddy and Roxy and the need to develop indoor games came up in order to prevent them from getting too bored when they have been inside too long. Below are different types of indoor games you can play with your dog. This is one of the easiest games out there for dog owners. You can’t go wrong when it comes to food and sniffing. All you need to do to start the game is show your dog a tiny treat or piece of kibble and you are set. Toss the food around the room. Remember, when playing this game, aim low so you aren’t hitting something that can be knocked down. 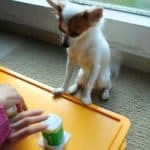 If your dog does not notice the food at first, you can start by dropping the treat beside them.. During the game, you can continue increasing the distance by tossing it further. You will be able to feed your dog entirely by just playing this game. You can make the game challenging by asking your Chi to stay and then hide the piece of dry food. 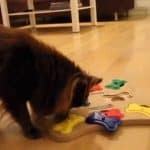 As a child, you may have played this game.It’s a fun indoor game with your kids, so why not with your pet? In this game you may require two players and the dog. One player will go and hide while the other holds the dog. Once the first player is hidden, the other player can release the dog. When the other player is found, one can make a big fuss about being found. This game has played by many people around the world and the end game is to con the player. 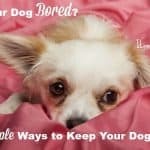 When you play with your dog, the end game is to provide entertainment as well as eliminate boredom for your pet. All you need is three cups and a small ball. Place the three cups upside down on the floor, take the ball, show your pet, hide it under one cup. Using your hands, pass the cups around in order to mix the arrangement. Once you are sure the dog will not find it, you can request the pet to point the cup where the ball is. If they point correctly, you give them a treat. If you need some time to do a chore, you can give your a dog a puzzle toy to play with. Teach your dog a new trick or command that they don’t know. Or brush up on some old tricks. 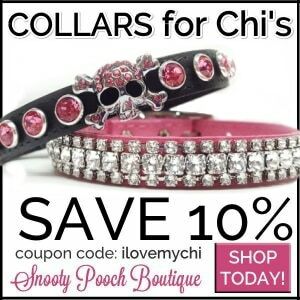 If you don’t practice them fairly often, your dog may forget how to do the, We found this out with the roll over trick. My son and I taught the dogs how to roll over a few years back but didn’t keep up with it. I tried to get them to do it the other day and they just stared at me like I was nuts. Some dogs love playing with bubbles so blow some for them and watch the fun! Here’s a cute video of a baby and Chihuahua with bubbles. Watch how the Chi reacts to the bubbles. 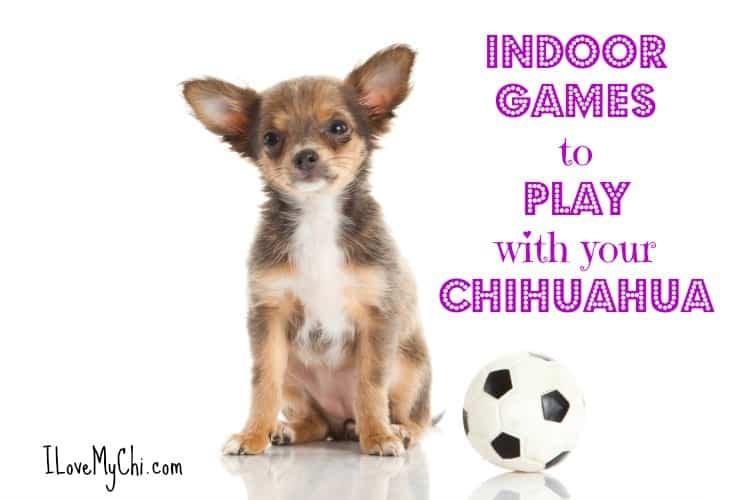 Now that you have some ideas for indoor games you can play with your Chihuahua, you need to know the benefits of indoor games for your pets. It helps your dog to exercise. When you play hide and seek, the dog will have to run from one point to another following your scent. This will ensure the limbs get the exercise they need especially during a rainy or snowy day. It helps to improve their tracking skills. 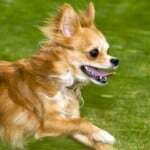 While your Chihuahua cannot go hunting, playing find the treat game will help to improve their tracking skills. This is the same for the hide and seek game. 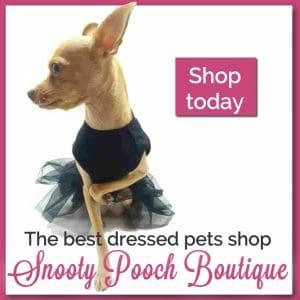 It offers great entertainment for your dog. When you cannot take your dog out, they do get bored. When you engage them in an indoor game, they get to be entertained. It’s great stimulation for their minds and bodies. It strengthens the bond between the two of you. Your dog loves to spend time with you and doing things together is the highlight of their day. It acts as a great stress reliever for both of you. Let me know how you like them Luna. I have 3 Chihuahuas, a teacup, a toy & a miniature, all females… all family. They’re Chihuahuas, so “fetch, just across the center of the room with a tennis ball or toy works fine. I use their sturdy vinyl squeaky-bone toys. I’ll bet they are fun to play with Helene! Let us know how they like the games Jennifer. You are very welcome Deva. Let us know how he likes 3 cup game. My bog is a Chow chow!!!!!!!!!!!!!!!!!! I now and for my brith day I am geeing a pitbull!!!!!!!!!!!!!!!! 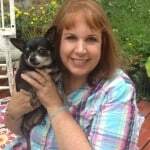 I love my dog but my one dogs died. I’m so sorry Alexia. I feel your pain. I just lost one of my oldsters 2 weeks ago. I really miss him. Oh my god I am sorry for your lost. I will keep him in my prays! Definitely. I wish dogs lived as long as people do. Pretty old Alexia. I have a granddaughter almost as old as you. She will be 9 in August. Mine is March 5th and my granddaughter ‘s is August 16th. Yes she has 2 French Bulldogs named Odie and Rubble and a cat too. cool can I tell you some thing. My mom does dad things and I do not live with her and my dad I do not now my dad . And ever day my mom lies to me . You are my only friend because kids think that i am a joke that why I talk to bigger kids . And she is in jail when I was a baby I went to foster care but lucky me I am back to my old house. I’m so sorry Alexia. Sounds like you have a hard life for a little girl. Mine was kind of hard too as a kid. Hang in there. It does get better once you are an adult and can make your own decisions. See if your school has a counselor you can talk to and let them know what is going on at home. They might be able to help.